As Super Bowl LII approaches, most people agree there is something special about the 2017 Philadelphia Eagles team. Some describe it as a sense of destiny, others have pointed out the team’s chemistry. But what is truly different and special about the team this year? As a lifelong fan, I thought it through and came up with a surprisingly extensive list of business lessons. Maybe this team has been successful because it’s being well run at all levels of the organization! What business lessons can we learn from the Philadelphia Eagles? The uncomfortable power struggle days between former head coach Chip Kelly and general manager Howie Roseman are gone; it’s obvious to all that Roseman has to sink or swim on his own merits and choices at this point. To his credit, he’s assembled a team whose opinions he respects and is willing to listen to. This is evidenced by the obvious sway of people like defensive coordinator Jim Schwartz (Nigel Bradham, Leodis McKelvin) and VP of player personnel Joe Douglas (Torrey Smith, Corey Graham, Alshon Jeffery) on the roster. But the ultimate accountability lies with Roseman, and he’s shown wisdom by listening to his team. It is also to team owner Jeffrey Lurie’s credit that he’s an owner who trusts his hired team to run his company, unlike Dallas Cowboys owner Jerry Jones, who has a long history of taking an active hand in managerial decisions, despite his executives and coaches having far more football experience than he. Smart owners and boards of directors create clear accountability by giving their hired executives autonomy. Much like former head coach Andy Reid, Doug Pederson was an unexpected choice as coach. With many Eagles fans clamoring for a more experienced candidate like Tom Coughlin, or one with a more impressive resume, like Ben McAdoo, Lurie, Roseman, and team tapped Pederson, a coach with only a few years experience as an offensive coordinator and less than a season’s-worth of play-calling experience. Their personal knowledge of Pederson due to his time with the organization as a player and assistant coach clearly swayed their decision, as did a glowing recommendation from Reid. Maybe his resume wasn’t as extensive as some, but they believed in his talent, passion and emotional intelligence. It always seems like a gamble to go for a less experienced candidate, but this is often where organizational rock stars are discovered. You can teach skills, but you can’t teach brilliance. Whether it’s Roseman’s work in free agency over the last few seasons, the mid-season trade for Jay Ajayi, or Pederson’s play calling, it’s clear the Eagles are staying aggressive on all levels. That being said, each of these decisions has been weighed carefully against the risks and long term strategy. The free agent signings have been team friendly deals, not long commitments which could strangle the salary cap down the road. The trade for Ajayi came with the remarkably cheap price tag of a 4th round pick, and Pederson’s aggressive play calling has not only worked well in most situations but is also grounded heavily in statistics. The Eagles organization is playing to win, not just on the field, but in the front office. Playing not to lose never wins, only playing to win wins. If Doug Pederson was coming from an ego-based or fear-based mentality it’s likely he never would have agreed to hire Jim Schwartz as defensive coordinator. Schwartz came to the role with head coaching experience, and if Pederson faltered, it’s entirely possible the fan base or even team leadership would have started thinking about handing his job to Schwartz. Instead, Pederson simply made the correct hire: the candidate who was best for the position. He wasn’t threatened by Schwartz’s experience; he knew it would add value to the defensive side of the ball and help the team win. Great leaders don’t fear adding talented, highly skilled people to their teams; they seek them out. The Eagles have clear and vocal leaders on offense, defense, and special teams. Carson Wentz, Malcom Jenkins, Chris Long, Darren Sproles, and Chris Maragos are just some of the players whose leadership is widely respected. They lead on the field with their play, in the locker room with their charisma, and off the field with their actions. You don’t need to be a manager to be a leader; leaders can exist on all teams and in all roles. They are the people who lead by example, stick to their values, embrace the culture, and put team accomplishments before individual accomplishments. This Eagles team celebrates and supports each other as a team. 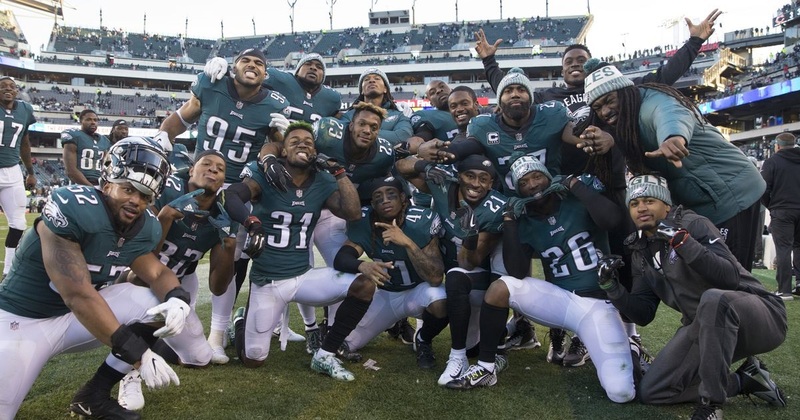 Egotistical behavior has all but disappeared as the team has gelled (when is the last time you saw Jalen Mills wagging his finger at someone while the Eagles were losing)? It’s clear the players have all bought in to a team-first culture. Even the running backs have embraced the running back by committee approach, despite it leading to their individual stats being far less impressive. Additionally, poor cultural fits have been shipped out despite impressive skill sets. This is an arguable choice in any organization, and as a fan I certainly miss the big plays DeSean Jackson and LeSean McCoy brought to the team. But who knows if the locker room chemistry would be what it is now if those two were still on the team? A healthy culture has to be a non-flexible organizational commitment. Individual skill sets sometimes have to be sacrificed if the people possessing them have a negative impact on culture. From Carson Wentz and Jordan Matthews’ trip to Haiti, Wentz’s relationship with Lukas Kusters, the Dutch Destroyer, Chris Long’s donation of his entire season’s salary to organizations working for educational equality, Malcom Jenkins’ outspoken and steadfast work to advance equality in the criminal justice system, or the large role that shared faith plays for much of the team, there are a lot of shining examples of purpose and service on this team. Purpose and service are critical parts of human happiness and emotional health. Organizations are no different and employee satisfaction is higher when purpose and service are ingrained in the company culture. Any great organization will have a diversity of thought and opinion, so it’s virtually impossible for company leadership to always agree with the beliefs of every team member. It is possible, however, to universally stand behind all team members’ rights to be individuals, with different opinions and choices. The alternative is to turn the organization into an authoritative police state by denying grown adults their individuality. Which organization do you think team members will work harder for? The Philadelphia Eagles’ veterans take an active role in teaching the younger players how to be better at their jobs. This can be anything from instilling a successful work ethic in practice and film rooms, to giving them tips in practice, feedback in games, or helping them learn their way around their new city when they first sign. Many of the younger players have spoken about how the older players have been fantastic mentors. Jason Peters, Darren Sproles, and Carson Wentz have all been mentioned as going out of their way to help their replacements after season ending injuries. This isn’t always the case in teams. Older players frequently get more concerned about their job security than their team and actively refuse to help younger players develop. Any organization is better off having a mix of young talent, team members with more experience, and creating a mentor/mentee relationship between the two. Watching the team celebrate together after big plays with The Electric Slide, bowling, and team photos has been one of the most fun parts of being a fan this season. While this is happening league-wide thanks to the NFL (No Fun League) relaxing its celebration rules, it’s obvious when watching the Eagles how much they actually like each other as people. Many members of the team have also spoken about how much they value their team members outside the facility and are known to regularly pray, study, hunt, dine, and sometimes even live together. There is no requirement in business that you have to be friends with your team members, but it has been proven that employees are much happier when they have at least one close friend at work. Being an underdog means never being over-confident. If you respect your opponent as potentially better than you, you tend to prepare with more detail and bring your A game. It’s also motivating when outsiders don’t believe in you; proving you can when people say you can’t is just plain fun. Having an underdog mentality helps ensure you stay abreast of what your competition is doing and pay attention to all the “little things” which make a huge difference in winning and retaining clients. The majority of fans thought wide receiver Nelson Agholor was a huge bust after his first two seasons. Doug Pederson saw enough to stick with him and he’s been a key contributor in his sophomore season. Running back Corey Clement was an undrafted free agent, but was evaluated on merit rather than pedigree and also became a key contributor. On the other hand, when the left guard position was weak, Pederson promptly replaced Isaac Seumalo with Chance Warmack. When Warmack didn’t get the job done, Pederson replaced him with Stefan Wisniewski, who finally stabilized the position. Pederson has shown a knack for knowing when to be patient and when to make a necessary change. One of the most valuable combinations of skills in leadership is 1) the ability to quickly and accurately assess team members’ talent and execution and 2) the decisiveness and confidence to make prompt hiring, training, and firing decisions. “Blocking and tackling” is a actually a sports term generally used in business to mean paying attention to the basics. In this case, it applies both literally and figuratively. The Eagles have shown a significant improvement in blocking and tackling since last year and have also focused on building a team which can win at the line of scrimmage on both offense and defense. This focus on the fundamentals has born huge dividends. In business, there are certain “blocking and tackling” behaviors which don’t require any skill but are hugely valuable: being on time, confirming back what you hear to ensure accurate communication, observing proper email etiquette, and keeping a positive attitude are good examples. Sustained focus on blocking and tackling keeps a team sharp and prevents them from adopting sloppy habits. The Eagles have lost what could easily have been a season-killing number of critical players to major injury this year: league MVP candidate and offensive captain quarterback Carson Wentz, future first ballot Hall of Fame left tackle and offensive captain Jason Peters, potential future Hall of Fame offensive weapon Darren Sproles, budding Pro Bowl and defensive play-calling middle linebacker Jordan Hicks, and special teams captain Chris Maragos. Rather than getting negative and giving up, in every case the Eagles rallied together with their “next man up” mantra. Second string players stepped up, were believed in and supported by the team, and did their jobs well. Unexpected things will always happen. If your team keeps its head, doesn’t get mired in feeling sorry for itself, and moves forward in lock step great things will happen. Whether they win or lose on Sunday, the 2017 Philadelphia Eagles have had a remarkably successful season. Their future looks bright, as well, but not just because of the players under contract. If the ownership, management, coaching staff, and players continue on with the accountability, commitment to culture, and savvy personnel decisions they made this year, this team will have sustained success. I look forward to watching them win and learning from their example. Now let’s go win a Super Bowl! E-A-G-L-E-S Eagles!